Continuing banks reforms in Ghana, from back in 2018, the Bank of Ghana issued a new statement (PDF) on the state of banking in the country for the end of that year. It stated that they had inherited a system with distressed banks that were not adequately capitalized, and which had high non-performing loans, and cases of insolvency and illiquidity – largely a result of poor corporate governance, false financial reporting, and insider dealings. They noted that they had revoked seven licenses and arranged for those banks to exit in an orderly way and that after a recapitalization push, there were 23 banks with universal banking licenses in Ghana that had met the minimum paid-up capital of GHF 400 million (~$83 million) at the end of the year. The Bank of Ghana had approved three merger applications – (i) of First Atlantic Merchant and Energy Commercial banks, (ii) of Omni and Sahel Sahara banks and that of (iii) First National and GHL banks, as pension funds had invested equity in five other banks through a special purpose holding company called the Ghana Amalgamated Trust (GAT). Another bank, GN Bank, was unable to comply with the capital requirement and its request to downgrade, from a universal banking license, to a savings and one had been approved. The Bank of Baroda has divested from Ghana following a decision by its parent bank which is wholly-owned by the Government of India. Subsequently, the Bank of Ghana has approved its winding down plan and allowed all the customers, assets and loans of Baroda Ghana to be migrated to Stanbic Bank Ghana. Two other banks Premium and Heritage had their licenses revoked, and a receiver manager from PricewaterhouseCoopers appointed to take charge of the banks. Premium was found to have been insolvent while Heritage had obtained its license in 2016 on the basis of capital with questionable sources. All deposits of the banks were transferred to Consolidated Bank and the Ghana government has issued a bond to support the transfer of assets. This entry was posted in Basel II, Corporate governance, Ghana, NPA, receiverships on January 6, 2019 by bankelele. Bloomberg: The Bloomberg Media Initiative Africa Financial Journalism Training program has resumed. After four years of training financial journalists in Kenya, South Africa and Nigeria, the BMIA now moves on to Ghana, Zambia, Tanzania, Cote d’Ivoire and Senegal. In the first part of the new phase, participating universities are the Ghana Institute of Journalism and University of Ghana Business School in Ghana, and the University of Zambia and University of Lusaka School of Business in Zambia. That does not mean journalists from other countries are excluded, but they have to travel to physically attend classes at the local universities, that run from January 2019 to June 2019, for two weeks in each month. The program is worth about $22,000 and is greatly subsidized by Bloomberg Philanthropies and the Stavros Niarchos Foundation, with the students not expected to pay more than $250. Students must also have a laptop computer and commit to attending all the classes. For the duration of the class, they also get prized access to the Blomberg terminal, an invaluable information resource for researching global financial markets. The deadline for applications is November 30. Reuters: The Reuters Journalism Training Programme – EMEA targets early journalists, with not more than three years experience, to undertake a nine-month training program, that includes with one month in London, and on the job training in bureaus in Africa, Europe and the Middle East. Applicants must have an interest in issues that affect companies, markets and economies and there seems to a preference for journalists with experience in areas like banking, financial analysis, accounting, law or computer science. The deadline for applications is November 30. 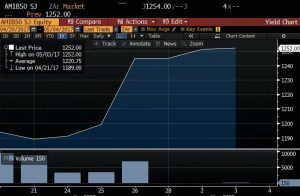 This entry was posted in Bloomberg, Ghana, ideaexchange, Zambia on November 25, 2018 by bankelele. August 2 saw bank closures in Ghana and Tanzania with interesting back stories on the institutions from regulators in both countries. Tanzania: the regulator Bank of Tanzania (BoT) issued notices that covered two separate cases. BoT took over Bank M, closing it down for three months and appointed a statutory manager (in place of the directors and management of the bank) who will determine the future of the institution. The statement (PDF) read that this was done for reasons that “..Bank M has critical liquidity problems and is unable to meet its maturing obligations. Continuation of the bank’s operations in the current liquidity condition is detrimental to the interests of depositors and poses systemic risk to the stability of the financial system.“. Two years ago, Bank M distanced itself from M Oriental Bank in Kenya. edit March 2019 Azania Bank has completed the acquisition of Bank M following the transfer of the banks’ assets and liabilities. The shareholders of Azania who include PSSSF (52%), NSSF (28%), EADB, and new shareholders including the National Health Insurance Fund (17%) agreed to the takeover and to recapitalise the bank. This is expected to be completed in 45 days with the bank opening in May 2019. – via The Citizen. The Bank of Tanzania also published an update (PDF) on other banks whose licenses it had revoked in January 2018. Of these earlier bank closures, three of them had been given up to 31 July to increase their level of capitalization and as a result, the BoT had approved a decision to merge one of the affected banks – Tanzania Women’s Bank with another bank – TPB which will result in all its customers, employees, assets, and liabilities transferring to TBP Plc . Meanwhile, two of the other banks, Tandahimba Community Bank and Kilimanjaro Cooperative Bank managed to meet the set minimum capital requirements and have been allowed to resume normal banking operations. uniBank: The Official Administrator appointed in March 2018 has found that the bank is beyond rehabilitation. Altogether, shareholders, related and connected parties of uniBank had taken out an amount of GH¢5.3 billion from the bank, constituting 75% of total assets of the bank. Over 89% of uniBank’s loans and advances book of GH¢3.74 billion as of 31st May 2018 was classified as non-performing, in addition to amounts totaling GH¢3.7 billion given out to shareholders and related parties which were not reported as part of the bank’s loan portfolio. uniBank’s shareholders and related parties have admitted to acquiring several real estate properties in their own names using the funds they took from the bank under questionable circumstances. Promises by these shareholders and related parties to refund monies by mid-July 2018 and legally transfer title to assets acquired back to uniBank have failed to materialize. Royal Bank: Its non-performing loans constitute 78.9% of total loans granted, owing to poor credit risk and liquidity risk management controls. A number of the bank’s transactions totaling GH¢161.92 million were entered into with shareholders, related and connected parties, structured to circumvent single obligor limits, conceal related party exposure limits, and overstate the capital position of the bank for the purpose of complying with the capital adequacy requirement. Sovereign Bank: Subsequent to its licensing, a substantial amount of the bank’s capital was placed with another financial institution as an investment for the bank. The bank has however not been able to retrieve this amount from the investment firm with which it was placed, and it has emerged that the investments were liquidated by the shareholders and parties related to them. Following enquiries by the Bank of Ghana, the promoters of the bank admitted that they did not pay for the shares they acquired in the bank. The promoters of the bank have since surrendered their shares to the bank, while the directors representing those original shareholders have since resigned. The Bank of Ghana has concluded that Sovereign Bank is insolvent, and that there is no reasonable prospect of a return to viability. Beige Bank: Funds purportedly used by the bank’s parent company to recapitalize were sourced from the bank through an affiliate company and in violation with regulatory requirements for bank capital. In particular, an amount of GH¢163.47 million belonging to the bank was placed with one of its affiliate companies (an asset management company) and subsequently transferred to its parent company which in turn purported to reinvest it in the bank as part of the bank’s capital. The placement by the bank with its affiliate company amounted to 86.86% of its net own funds as at end June 2018, thereby breaching the regulatory limit of 10%. Also, the bank has not been able to recover these funds for its operations. Construction Bank: the initial minimum paid up capital of the bank provided by its promoter/shareholder, was funded by loans obtained from NIB Bank Limited. An amount of GH¢80 million out of the amounts reported as the bank’s paid-up capital and purportedly placed with NIB and uniBank, remains inaccessible to the bank – and the bank’s inability to inject additional capital to restore its capital adequacy to the minimum capital of GH¢ 120 million required at the date of licensing threatens the safety of depositors’ funds and the stability of the banking system. This entry was posted in Basel II, Ghana, NPA, Oriental Bank, receiverships, tanzania on August 3, 2018 by bankelele. EDIT September 5 2018: MTN Ghana shares listed on September 5. 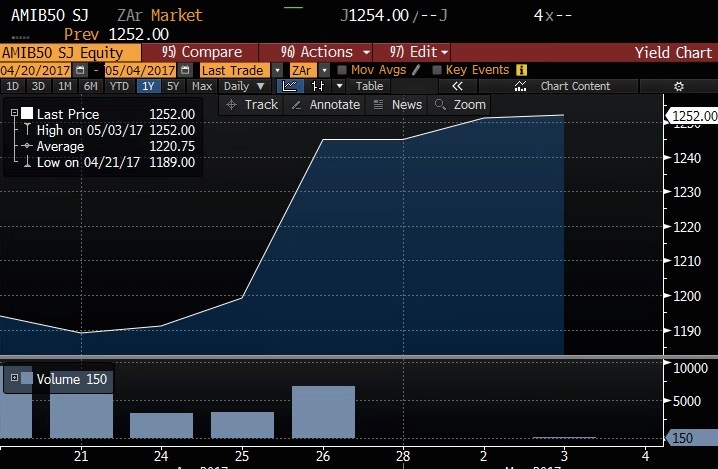 Bloomberg reports that Africa’s largest mobile-phone company sold 1.5 billion shares in its Ghana unit at 75 pesewas each, a large addition to potential volumes on a market where 323 million shares were traded in the whole of 2017, according to data from the bourse. Of the 128,152 new shareholders who bought stock in MTN Ghana, 127,653 are retail investors. The exchange had 976,068 investors in equity and debt securities last year. On Wednesday, the stock closed unchanged after more than 5 million shares were traded. Original June 4: MTN Ghana the leading Telco in that country has just launched an IPO as part of a requirement for obtaining a 4G license in 2015 and which has resulted in the offer of 35% ownership in the company to Ghanaian investors and with the shares listed thereafter. MTN Ghana: It is the largest telco company in Ghana with 17.8 million subscribers, and with an estimated 47% market share and 12 million data customers. MTN Ghana had 2017 revenue of GHS 3.42 billion (about $728 million) and a net profit of GHS 715 million ($152 million). They target is to pay put 60% of profit as dividends. It is part of the MTN Group that has 217 million customers across 22 Africa and the Middle East countries such as Uganda, South Sudan South Africa Sudan (not Kenya but for a corporate business unit), and it is the largest telco in 14 of these countries. Ghana: Ghana is the second biggest economy in West Africa. It has a population of 28 million, and a recent average economic growth rate of 7.0% per year. Ghana has a mobile penetration of 130% (38 million customers), and besides MTN, other companies are Airtel, Tigo, Vodafone and Glo. GSE: The MTN Ghana shares, which will trade as MTNGH, will be listed on the Ghana stock exchange, which operates three markets including a main market with 34 listed equities, an alternative market and a fixed income market. Mobile Money: 11.6 million customers use it to do a variety of things including money transfers (they have 90,000 agents/merchants), buy airtime, bill payments, bulk payments, pay fees to schools on the platform, save (and invest), “TBill4All” (partnership with Ecobank Ghana enables buying of treasury bills), “Y’ello” save (partnerships with Fidelity Bank for savings), international remittance, send money to bank accounts, buy “mi-life” insurance and do ATM cash-outs at machines at 8 of the 17 banks that MTN partners with. “MoMo” has also used for payment in the Google store since December 2017. Taxes: MTN Ghana pays about 3% of Ghana government tax revenue and supports 500,000 jobs through its ecosystem of suppliers. It paid 1.1 billion cedis ($225 million) in 2017 as income tax, communication fees, withholding, customs duties, PAYE and other taxes. Threats: The document cites threats to MTN Ghana growth plans including; battery theft (from cell sites), fibre cuts (average 3 per day on their 5,000 kilometre nationwide fibre network), SImbox fraud, load shedding (electricity power shortages), OTT calls and competition from other Telco’s. Timelines: The IPO runs for nine weeks from 29 May to 31 July 2018. There will be regional sideshows for two weeks in June, and allotment and listing are planned for on 5 September 2018. If there is an oversubscription, refunds will be from August 8. Transaction advisors: The sponsoring stockbroker is IC securities, and receiving agents are all stockbrokers and receiving banks are almost about 20 Ghanaian banks – such as Access, Ecobank, Barclays, UBA, FBN, GT Bank, Societe Generale, Standard Chartered, Stanbic, Zenith, FBN, GN, and Fidelity. Valuation: They are offering 4.63 billion shares at GHS 0.75 per share (about $0.16 or Kenya 16.1 per share ) and MTN Ghana can employees get a 10% discount. The offer documents by MTN Ghana compared its implied value from the IPO of about $2.2 billion (GHS 10 billion) to other peer Telco’s including MTN Group (South Africa) $18.6 billion, Bharti Airtel (India) $26.2 billion), Etisalat (UAE) $40.5 billion), Safaricom (Kenya) $11.5 billion), Itissalat Al-Maghrib (Morocco) $14.3 billion, Sonatel (Senegal) $4.0 billion, and Vodacom Group (SA) $22.6 billion) . This entry was posted in Ghana, MTN, NSE investor awareness, Safaricom IPO on June 4, 2018 by bankelele. EDIT: 11 April 2019: Kenya Airways has activated its codeshare with Delta Airlines that will enable connectivity to 11 US cities (Chicago, Houston, Denver, Orlando, Miami, Raleigh, Phoenix Philadelphia, Charlotte, Columbus, and Kansas City) and 4 Canadian cities (Toronto, Montreal, Ottawa, Edmonton). It also announced a switch from five to seven weekly flights to New York from June to serve the 2019 summer season. EDIT 15 August 2018 Delta Air Lines entered into a codeshare partnership with Kenya Airways. 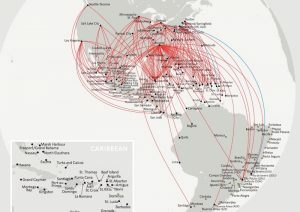 Effective August 15, Delta’s code will be placed on Kenya Airways’ flights from Amsterdam, Paris, London, and Accra to Nairobi, enhancing connectivity and providing customers with a one-stop seamless travel experience from the United States. In addition, Delta will place its code on Kenya Airways’ services to more than 10 key cities across Africa, including: Addis Ababa, Ethiopia; Lilongwe, Malawi; Maputo, Mozambique; Johannesburg, South Africa and Djibouti City, Djibouti. May 10 2018 Delta Air Lines and Kenya Airways have applied to the US Department of Transportation with an expedited request for the two airlines to be expeditiously granted reciprocal codeshare rights for each others’ flights. The application (PDF) dated 7th May, applies to Delta and Delta Connection flights in North America, Latin America, and the Caribbean to carry the Kenya Airways (KQ) code, while the Kenya Airways will immediately place Delta’s code (DL) on flights between Nairobi to/from Johannesburg (South Africa), Lilongwe, (Malawi), Djibouti (Rep. of Djibouti) and Maputo, (Mozambique). Delta routes will be part of the codeshare. Delta which reaches 325 destinations, currently has services to Dakar (Senegal), Lagos, Accra, and Johannesburg, while Kenya Airways is scheduled to start flights to New York in October 2018. There is no mention of Air France/KLM, who have been Kenya Airways long-term joint-venture partner for two decades, in the new US codeshare application. The new codeshare arrangement which covers “persons, property, and mail,” is an expansion of a previously approved reciprocal codeshare arrangement between Northwest Airlines and Kenya Airways for flights originating in Kenya and North America. Northwest merged with Delta in 2009. The new codeshare will also extend to all Delta Connection regional affiliate airlines (namely Compass Airlines, Endeavor Air, ExpressJet Airlines, GoJet Airlines, Republic Airline and SkyWest Airlines). Aside from Kenya, Ethiopian Airlines, which flies to several American destinations of Washington (DC), Newark, Los Angeles, Chicago, Toronto (Canada), Buenos Aires (Argentina) and Rio de Janeiro & São Paulo (Brazil) is also expanding its American network via routes in West Africa. The airline is reported to have secured rights to fly passengers to Houston via Accra, while it also confirmed that it had entered a codeshare with Air Côte d’Ivoire for flights to Newark via Abidjan. This entry was posted in delta airlines, Ethiopia, Ghana, Ivory Coast, Kenya Airways on May 10, 2018 by bankelele.